5 stars: I just finished reading this one again. If I had to pick my favorite books in the series, this one would be 2nd, right behind the first book. Rilla of Ingleside (book #8) would be 3rd. The rest--eh--somewhere in the middle. Don't get me wrong--the entire series is near and dear to my heart, but this is one of the nearest and dearest. 5. The house itself, and Four Winds harbor. 4. "And ye shall know the truth, and the truth shall make you free." (John 8:32) A scripture made literal in miraculous ways. 3. Anne's heartbreaking loss of her first baby, and despite shadowy fears, a healthy baby to love the second time around. This didn't mean nearly so much to me when I read these books as a teenager. Now that I am a mother, I feel such a kinship with Anne. I experienced a miscarriage with my first pregnancy, then delivered a healthy baby boy the second time. So I've been there. I am not ashamed to admit that I was in tears reading the chapter of baby Joyce's short life. He's one of my favorite characters in the whole series. He's such a fine old gentleman, even though he was never taught to be one, and so humble and selfless. Still human though, as his baiting of Cornelia Bryant proves. I can just hear his voice as I read his dialogue, and my mental picture of him is crystal clear. 1. She FINALLY marries Gilbert!! Did it take them long enough? 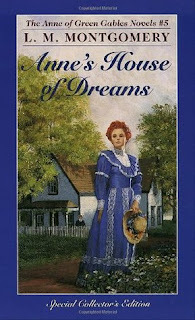 You see it coming in Anne of Avonlea, then Montgomery makes you wait for 2 whole books more! First, they both go to college, then he goes to medical school while she goes off to teach at a girl's school, then finally! It's about time. That's all I'm saying. I just love seeing their relationship finally have a chance to develop. This is really the only book that you get to see inside their marriage. The last 2 books are mostly about their kids, with Anne and Gilbert present, certainly, but more so as background. They are sweet but not sappy, with some tender moments, and even have some lively disagreements. In fact, the chapter of their big fight is one of my favorites--just because you can see that they're still 2 individuals, each with their own strong opinions. So true to life. Then they make up and later Anne defends Gilbert using some of the arguments he used on her. Yes! How would you rank the Anne books? Do you have a favorite? Do tell!